Herbs and spices have been used for thousands of years and were once traded like gold. Explorers were sent far away to discover them and many wars were fought over spices. Spices were much more than just a culinary ingredient. They were used as medicine, preservatives, pest deterrent, in cosmetics and perfume. Thankfully, as we start to become more health conscious again, a lot of the forgotten knowledge of herbs and spices is rediscovered. Why use artificial flavouring and additives when we can cook much tastier and healthier meals using what nature provides us with in its natural state? Most modern medicines derived from plants and today there are many scientific studies being carried out about the health benefits of herbs and spices to prove what our ancestors knew already all along. Herbs and spices contain many nutrients, antioxidants and polyphenols that can play a role in improving overall health. The most talked about herbs and spices are cinnamon, chilli peppers, turmeric, garlic, oregano, basil, thyme, ginger, clove, black pepper and rosemary, many of which we are using in our mixes. Another good reason to add our herb and spice mixes to your food is that they are naturally gluten free and have no additives. We hope you will try and enjoy cooking with our herb and spice blends. With 10 blends to choose from Kylemore Acres Mixes add amazing flavour to your meals. 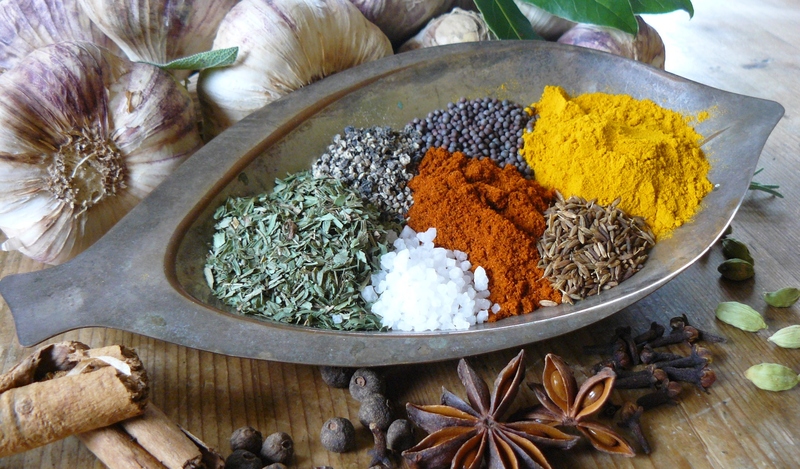 Use our blends to get the benefits of herbs and spices without any additives. Each blend is handmade by Joe & Martina at their home in Loughrea.